(BOSTON) — The CRISPR-Cas9 system has come to be known as the quintessential tool that allows researchers to edit the DNA sequences of many organisms and cell types. However, scientists are also increasingly recognizing that it can be used to activate the expression of genes. To that end, they have built a number of synthetic gene activating Cas9 proteins to study gene functions or to compensate for insufficient gene expression in potential therapeutic approaches. A Wyss Institute research team has rigorously compared various gene-activating Cas9 proteins across cell types from human tissues and animal species. Their study can serve as a guide in research and development of new therapies. 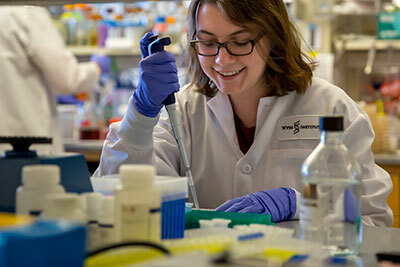 Shown in the picture is one of the two co-first authors, Wyss Research Fellow Marcelle Tuttle, performing Cas9 experiments in the laboratory. Credit: Wyss Institute at Harvard University. "In some cases, maximum possible activation of a target gene is necessary to achieve a cellular or therapeutic effect. We managed to cooperatively enhance expression of specific genes when we targeted them with three copies of a top performing activator using three different guide RNAs," said Alejandro Chavez, Ph.D., a Postdoctoral Fellow and the study’s co-first author. "The ease of use of CRISPR-Cas9 offers enormous potential for development of genome therapeutics. This study provides valuable new design criteria that will help enable synthetic biologists and bioengineers to develop more effective targeted genome engineering technologies in the future," said Wyss Institute Founding Director Donald Ingber, M.D., Ph.D., who is the Judah Folkman Professor of Vascular Biology at Harvard Medical School and the Vascular Biology Program at Boston Children’s Hospital, and also Professor of Bioengineering at the Harvard John A. Paulson School of Engineering and Applied Sciences.